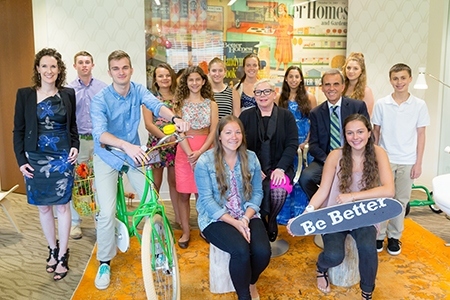 Continuing its groundbreaking industry research on the home-buying expectations of “Generation Z”—the current cohort of 21 million U.S. teens born from the mid-to-late 1990s through the present—Better Homes and Gardens® Real Estate recently gathered a focus group of 13-18-year-olds at its Madison, N.J., Realogy headquarters, for a day-long Gen Z Advisory Board session, diving deep into discussions with the teens on their views on homeownership and how they would change the way real estate business is conducted today and into the future. With BHGRE looking to the future of the home buying industry to help drive its business, in focus with the Gen Z Advisory Board, was what this not-so-far-off influential generation of homebuyers thinks about real estate agents and the importance of their role with consumers; real estate websites and what information they want from them; the transaction process as it currently exists; and most important, their perspective on the American Dream of homeownership and what they hope to achieve in that regard in the future. 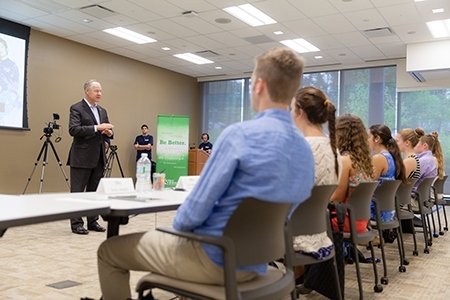 RISMedia was granted exclusive on-site coverage of the focus group discussion. Alex Perriello, president and CEO, Realogy Franchise Group; Sherry Chris, president and CEO, Better Homes and Gardens Real Estate and Jennifer Marchetti, CMO, Better Homes and Gardens Real Estate with the panel of teens who participating in its Real Estate Advisory Board event July 28. Why all the focus on today’s teens? At nearly 21 million strong, Gen Z teens are a group of young people whose every move has been chronicled online. They know how to buy any item with the click of a button; and they have never known a world without instant access to any piece of information. They are socially aware, both in the human and media sense, economically watchful and technologically advanced. They don’t just represent the future, they are creating it. Richard Smith, chairman, CEO and president, Realogy Holdings Corp shares some opening remarks with the teens. “Gen Z is a new paradigm: a generation whose entire world and self-views are crafted by technology, immediacy and access. To prepare for this, we shifted our discussion—and our gaze—further into the future,” said Sherry Chris, president and CEO of Better Homes and Gardens Real Estate, following the first of its kind study on the future home-buying aspirations of U.S. teens last year. BHGRE’s study of 1,000 teens revealed that Gen Z is surprisingly traditional in their views toward homeownership; they’re keenly aware of the importance of saving and willing to give up modern luxuries for the mainstream definition of the American Dream. 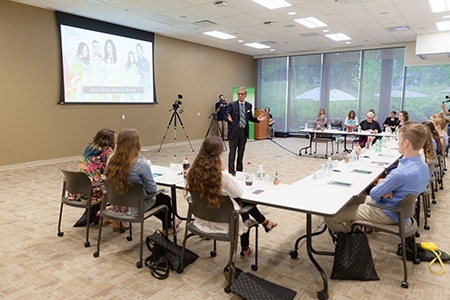 Based on its study findings and eye toward future business, the company decided to continue its research by bringing in the teen Advisory Board, which took place on Tuesday, July 28 and was comprised of 11 teens, age 13-18 from New Jersey to Iowa. Alex Perriello, president and CEO, Realogy Franchise Group, welcoming the teens. Realogy and Better Homes and Gardens Real Estate executives participating in the day’s events included: Richard Smith, chairman, CEO and president, Realogy Holdings Corp.; Alex Perriello, president and CEO, Realogy Franchise Group; Sherry Chris, president and CEO, Better Homes and Gardens Real Estate, Jennifer Marchetti, CMO, Better Homes and Gardens Real Estate, and Amy Chorew, VP, Platform Development, Better Homes and Gardens Real Estate. The teen participants included Alexis Utter, Alexis Amendolaro, Renner Kwittken, Lily Horwitz, Ryan Green, Brianna Gosden, Cassandra Smith, Emily Boylan, Victoria DeTrolio, Delia Hellander and Baxter Newkirk. The day began with short, individual video interviews with the teens with general questions about real estate and their thoughts on a future career in real estate, followed by a Q&A session to ask the teens questions about how they make buying decisions, recent purchases they’ve made, have they moved recently and opinions on key aspects of home and real estate. The day culminated with an industry brainstorm on opinions on a career in real estate and how to educate this age group on real estate at an earlier age. Sherry Chris, president and CEO, Better Homes and Gardens Real Estate enjoying the group discussion. 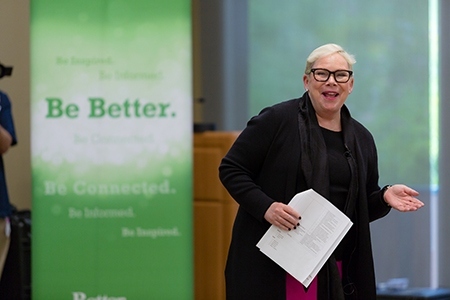 Sherry Chris opened the dialog by talking about the role of a real estate agent, why it’s important that consumers select the right agent for their needs, what the teens’ own family experiences were in home buying and moving, and shared with the group BHGRE’s mission to improve how consumers connect with agents—and also how their input would be helpful to them in that effort. By maximizing the use of technology is how BHGRE aims to minimize that stress and time challenge that consumers have long associated with finding the best agent and ultimately their perfect home. Marchetti led the Q&A next with a series of questions about what criteria the teens use now to make their buying decisions, both large and small, and how those very same thought processes are used by homebuyers. Discussion continued about purchases they’ve made with little-to-no thought, like clothes and shoes, to more impactful decisions like what college to go to. Online versus in-person purchases, having too much information or not enough, good and bad customer service experiences and how they handled them and buyer’s remorse were also discussed. When faced with too much information about a purchase, the group also talked about how “following their gut instinct” factors in, as well as who they turn to for trusted advice to help them make more important decisions. Mom or dad, older siblings and other close family members or friends were their top go-to sources for support in making the tough choices. In contrast, for less-significant purchases, the teens say they quickly turn to the technology they’ve been born and raised on to expedite the buying process. Delia Hellander, 17, said she might quickly send a picture of a shirt she’s about to buy to a friend on Snapchat to get some instant feedback. This pattern of using technology for research, purchases of non-emotional items and quick text exchanges about less significant decisions—and conversely, relying on word of mouth from trusted sources and wanting to experience more emotional or expensive purchases in person, would reveal itself often in the discussion. The teens are smart shoppers too. “The more expensive the purchase the more confident you want to be about buying it and the more information you want about it,” said Baxter Newkirk, 18. Jennifer Marchetti, CMO, Better Homes and Gardens Real Estate, during one of the Advisory Board Q&A sessions. Contrary to the thinking that today’s teens are detached, when asked what home means to them, all responded with a very connected and heart-warming answer. Working with an agent would be easier they agreed, although most pointed out they’d do most of the research online themselves and once their choices were narrowed down, they’d contact an agent to assist them. The teens said they would only work with an agent that was recommended to them by someone they knew and trusted. In a hypothetical real estate purchase, just like their every-day purchases discussed earlier, the Gen Zers trust personal recommendations over online reviews. Marchetti asked, “Is it acceptable not to have immediate feedback for you? If you texted your agent at midnight, would you expect to hear back immediately?” “It would be awesome, but I don’t expect it to just be there,” Green said. Next the teens were shown several popular real estate brand websites and were asked to give their feedback of what they liked and didn’t like about them. First and foremost, Gen Zers can’t get enough pictures; the more the better, they all agreed. They love multiple pictures of the same room from many different angles. A thorough description of the home’s features is important to them and Information about “what’s around” – the town, the schools and the social scene near the home is important to them too. They liked sites with maps to be able to see what’s in the area; drive-time information was noted as a positive – a feature on one site where visitors may enter an address, their place of work for example, to see how far their commute would be from that property. They also liked websites that displayed information about the house in an infographic-style layout for ease of understanding, having the ability to keep track of favorite properties in a smartphone app, and sites that included agent profiles with information about what homes they’ve sold in the past. Video and virtual tours are important to them too. All the teens wanted to see more information about the technology features and capabilities of the homes, as well as the high-speed Internet availability. The Next Generation of Real Estate Professionals? In a brief afternoon segment, BHGRE’s Vice President, Platform Development, Amy Chorew asked the group about their future career aspirations and talked a little about what real estate agents do in their daily business. Chorew asked about what qualities they think real estate professionals should have. These included confidence in what they’re selling, people skills, compassion, caring but professional, appeal to the buyer, and making a connection between the buyer and what’s appealing about the house. Knowing their business, knowing what if any problems there might be with a house and really listening to what the client wants were key to the group. As it turns out, a lot. Gen Zers like the flexibility, the entrepreneurial nature of the real estate profession and the ability, with hard work, to earn an unlimited income. Stay tuned to RISMedia for continuing coverage of BHGRE’s in-depth research on Gen Z and how this future generation of homeowners will be shaping the industry.